There are a lot of powder coating shops available to use because most Sheet Metal Shops subcontract that process out. 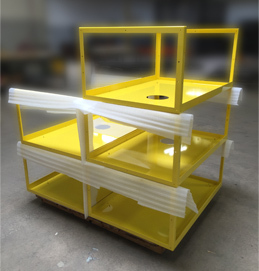 At Serco Mfg we found we can control our quality, costs and lead times by performing our own powder coating in house. Instead of driving the parts across town, we simply roll them across the building, no additional pack lists and packaging needed which reduces material and labor costs. We don’t have as diverse of a color pallet to work with as a independent powder coater so we can streamline our color changes to provide more spraying time and setup time. Many parts that we have are difficult to clean by spraying them so we have installed a 6 stage Immersion System to clean even the most difficult parts. We made the process easier and it provides a consistent quality to our customers since it is not based on an individual’s skill level.